I went to a baby shower last week for a girl who is expecting twin girls in October. There were pink cupcakes, pink hart-shaped cookies, raspberry swirl cheesecake, pink lemonade..... Lots of pink desserts were there at the party. 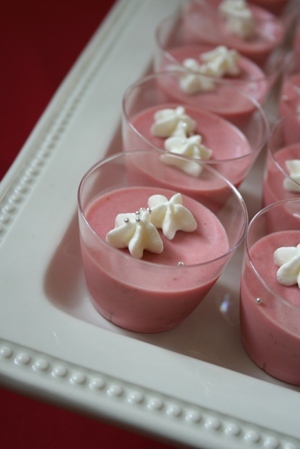 I took these cups of strawberry mousse. For the twin girls, I piped 2 star-shaped dabs of whipped cream on each cup and finished them with some silver-coated sugar dots. They turned out cute, yes? It was fun watching her open all the presents. I love tiny little outfits. They are so darling. I wish the best of luck to the new mommy of twins!